Chenna is made by curdling full-fat milk and draining the extra moisture. Addition of sour agents like vinegar or lemon juice result into separation of whey from milk. If you are lazy to make chenna at home, you can use cottage cheese or paneer, which is used extensively in Indian cuisine to make everything from subzis to pulaos and is a handy ingredient in the preparation of sweets as well. Paneer imparts not just softness but a very interesting, crumbly mouth-feel, which lands quite richly on the palate. You can simply blend paneer in a mixer grinder or mix it using your palm to give the required texture. Chenna is extensively used in preparation of an array of Bengali sweets like Sandesh, Chum Chum, Rasgulla, Rasmalai. You can even stuff rasmalai to make Fresh Fruits Stuffed Rasmalai a dessert beyond comparison, a creation that has to be experienced to be understood! The rich, milky flavour of succulent rasmalai is complemented beautifully by a fruity stuffing, and enhanced further by a topping of masala milk. Sandesh is made by combining powdered sugar and different flavours and essences. You can try your hands on making simple Sandesh made by mixing chenna or sugar or flavored Sandesh like the rose Sandesh, pineapple Sandesh, Chocolate Sandesh. To enhance the appearance, you can stack chenna with colorful fruits in a glass to make Layered Fruit Sandesh . Our website also has quick and easy recipes that make use of paneer like the Mixed Fruit Sandesh, Quick Apple Sandesh. You can even combine 2-3 sandesh to make cylindrical roll of Chocolate- Vanilla and Orange Sandesh that can be sliced after refrigerating. You can shape the chenna into small roundels or get moulds from the market to give them different shapes. Apart from the Sandesh, you can make Indian desserts like the delightful Chenna Malpua, Saffron Chenna Pie that will be loved by all. Also, the paneer pistachio rolls put paneer to good use. 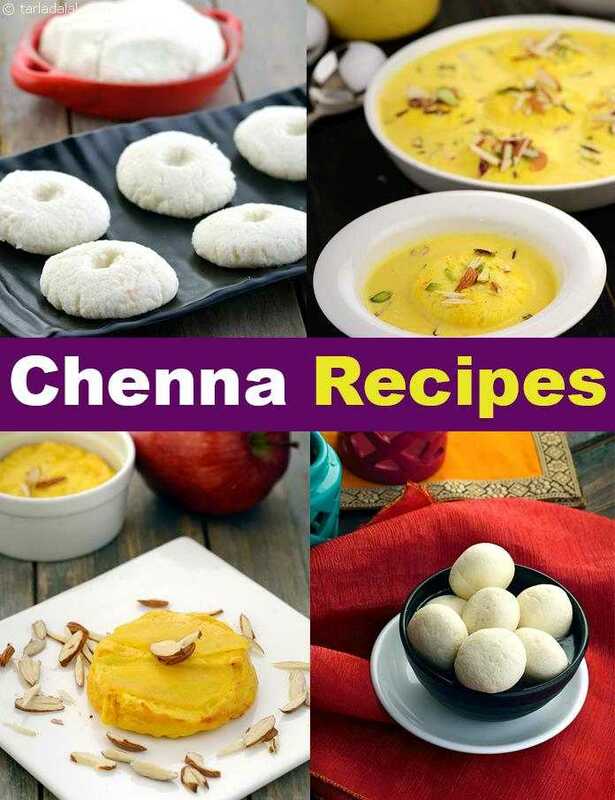 If you enjoyed our 113 Chenna Recipe collection, then you will enjoy the other Indain Dessert articles given below. The traditional Bengali dessert gets a peppy twist with the addition of orange segments. The Orange Chennar Payesh, a lip-smacking and luxurious dessert, can also be quickly made as shown here, using paneer and condensed milk. In fact, eight minutes is all it takes! for an extra special touch.